• • Mae West wrote: Father established a livery stable business of carriages, surreys and coaches for hire, and maintained horse stands for business or pleasure during the summer at different beach resorts. In the winter he also had horse-drawn sleighs, complete with jingle bells. • • Mae West wrote: It was a prosperous business until automobiles became popular, after which time my father became a private detective and established a detective agency. He developed a night alarm system for the protection of stores and warehouses, which were being frequently burglarized by thieves whom the police force could not catch. Later he went into real estate. • • Mae West wrote: My mother, Matilda Delker Doelger, was born in Bavaria, Germany, in a town near the elf-filled Black Forest. • • My mother Matilda Delker • • . . .
• • NYC broadcast journalist John Wingate interviewed Mae West backstage before the opening of a revival of "Diamond Lil" on Broadway. Their 2-minute exchange is quite funny and was heard in the NYC area over the popular radio station WOR. • • New York City's "picture newspaper" The Daily Mirror reported that Mae West "collapsed in her dressing room at the Shubert Riviera Theatre" [sic]. • • Mae West said: "I used to like to play Post Office. Mamma didn't object. But she got mad if I started giving special deliveries to one boy all the time. She wanted me to play with them all." • • The Los Angeles Times wrote about Mae West. • • Edwin F. Schallert wrote: Teaming Mae West and W. C. Fields commends itself as a first-class idea in showmanship. 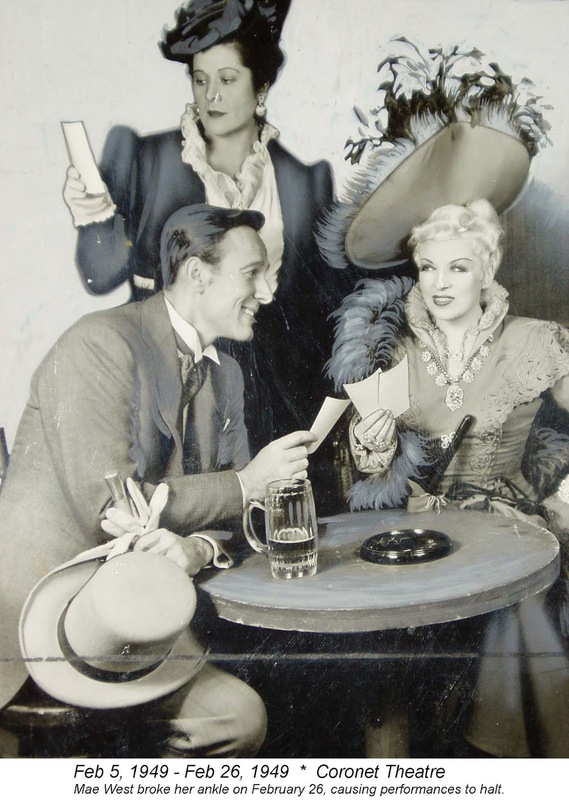 Wherefore the picture, "My Little Chickadee," will have plenty in its favor when distributed at the theaters throughout the nation. . . .
• • The Mae West Blog was started fourteen years ago in July 2004. You are reading the 4141st blog post. Unlike many blogs, which draw upon reprinted content from a newspaper or a magazine and/ or summaries, links, or photos, the mainstay of this blog is its fresh material focused on the life and career of Mae West, herself an American original.